Welcome to the official support page for Learn Cocoa on the Mac, now in its second edition! Released in 2013, this new edition has been completely overhauled to cover OS X Mountain Lion and Xcode 4. All the technologies still work great on OS X Mavericks and Xcode 5, of course! Have any questions or comments about the book? Visit our forum, where you can post your questions, answer other folks' questions, or read about stuff that we've got going on. We'll be sure to post any changes to the book and the book projects. Looking for the source code that goes along with the book? The source code is now available at the Apress website. Navigate to the Source Code/Downloads section and you'll find a download link for the source code. You can also see what the authors are up to by following @jacknutting and @pclark on Twitter. 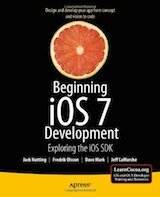 Year after year, this book has been the resource of choice for thousands of new iOS developers. The latest edition has been updated to cover iOS 7 and the latest changes to Xcode 5, including a brand new chapter on Sprite Kit. Have any questions or comments about the book? Visit our forum, where you can post your questions, answer other folks' questions, or read about stuff that we've got going on. Looking for the source code that goes along with the book? The source code is now available via download right here. TextShooter, the example application created in the book's chapter on Sprite Kit, has been extended for App Store release, and it has been released as open source on github. You can also see what the authors are up to by following @davemark, @jacknutting, @jeff_lamarche, and @peylow on Twitter.